Being enraged by Kaiji’s tricky victory at the Pachinko, chairman Hyoudou orders his subordinates to capture Kaiji immediately. Once Kaiji is brought, Hyoudou forces him to bet his life one last time. If Kaiji wins, he walks away with Hyoudou’s fortune; if he loses, he loses his life. 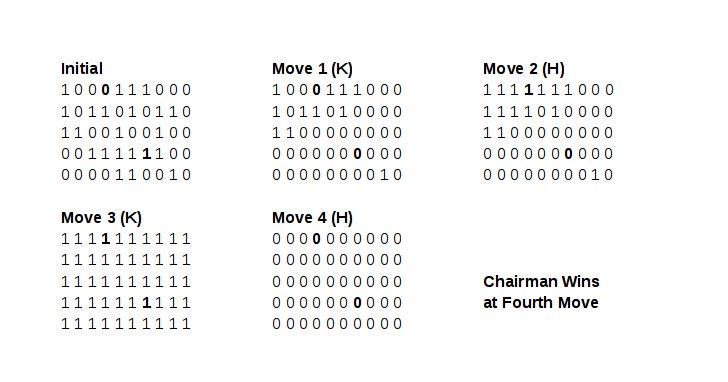 The game is played on a grid with M rows and N columns. Each cell of the grid is either black or white. Initially, Kaiji and Hyoudou each walks blindfolded to two different cells at random. Kaiji and Hyoudou alternate moves; Kaiji moves first. On a player’s move, the color of the cell under his feet is flipped (i.e. from black to white or from white to black); any adjacent cell with the same color is flipped as well. And this process is repeated for their adjacent cells with the same color and so on. Note that, two cells are adjacent if they share a side. Thus, a cell may have maximum four adjacent cells. A cell on a sideline has three and a cell at a corner has only two adjacent cells. Notice that a player does not actually move all over the place. He always remains in his initial cell. Only the described cells flip color during his move. The first player who is able to flip the color of the opponent’s cell wins the game. We represent the grid as a matrix of 0s and 1s (0 means white and 1 means black cell). The positions of Kaiji and Hyoudou in the grid are also given. We show the steps of a sample game for clarity. Here, initially Kaiji is in the cell with the bold 1 (row 4, column 7) and Hyoudou is in the cell with the bold 0 (row 1, column 4). Kaiji moves first and they alternate moves. At the fourth and final move of the game, Hyoudou wins by flipping the color of Kaiji’s cell. Kaiji has no way to know, what underhanded trick might be performed by the sinister chairman of the underworld during the blindfold walk. In a game of seemingly pure chance with no room for strategy and the players not moving a muscle, will Kaiji’s luck carry him through? Or, will the chairman’s evil laughter echo throughout the room? The first line of the input gives the number of test cases, T (1 <= T <= 30). T test cases follow. 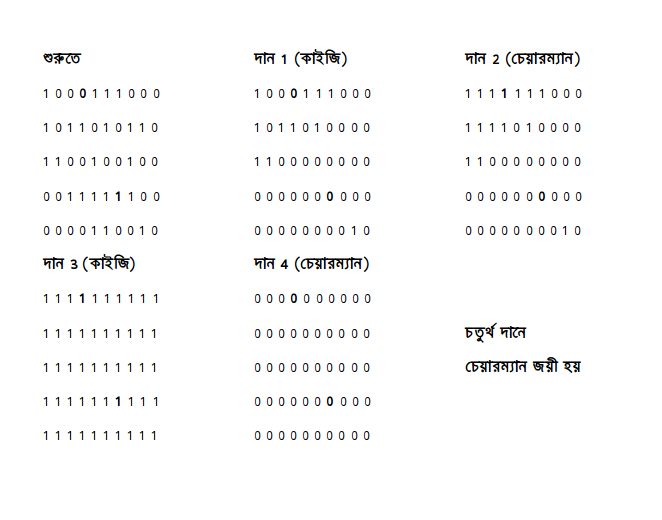 Each will consist of one line containing two integers M (number of rows) and N (number of columns), where 1 <= M, N <= 100. This is followed by M lines each containing N space-separated integers (each integer is either 0 or 1). The next line containing four integers rk, ck, rh and ch. rk and ck are the initial row and column of Kaiji’s cell; while, rh and ch are the initial row and column of Hyoudou’s cell. For each test case, output one line containing a single word W, where W is “Kaiji” if Kaiji wins and “Chairman” if Hyoudou wins. The word must be printed without the quotation marks.